When was the last time you heard a seminar speaker claim there was ‘no difference’ between two groups because the difference was ‘statistically non-significant’? If your experience matches ours, there’s a good chance that this happened at the last talk you attended. We hope that at least someone in the audience was perplexed if, as frequently happens, a plot or table showed that there actually was a difference. How do statistics so often lead scientists to deny differences that those not educated in statistics can plainly see? For several generations, researchers have been warned that a statistically non-significant result does not ‘prove’ the null hypothesis (the hypothesis that there is no difference between groups or no effect of a treatment on some measured outcome)1. Nor do statistically significant results ‘prove’ some other hypothesis. Such misconceptions have famously warped the literature with overstated claims and, less famously, led to claims of conflicts between studies where none exists. We have some proposals to keep scientists from falling prey to these misconceptions. For example, consider a series of analyses of unintended effects of anti-inflammatory drugs2. Because their results were statistically non-significant, one set of researchers concluded that exposure to the drugs was “not associated” with new-onset atrial fibrillation (the most common disturbance to heart rhythm) and that the results stood in contrast to those from an earlier study with a statistically significant outcome. It is ludicrous to conclude that the statistically non-significant results showed “no association”, when the interval estimate included serious risk increases; it is equally absurd to claim these results were in contrast with the earlier results showing an identical observed effect. Yet these common practices show how reliance on thresholds of statistical significance can mislead us (see ‘Beware false conclusions’). Source: V. Amrhein et al. We are far from alone. When we invited others to read a draft of this comment and sign their names if they concurred with our message, 250 did so within the first 24 hours. A week later, we had more than 800 signatories — all checked for an academic affiliation or other indication of present or past work in a field that depends on statistical modelling (see the list and final count of signatories in the Supplementary Information). These include statisticians, clinical and medical researchers, biologists and psychologists from more than 50 countries and across all continents except Antarctica. One advocate called it a “surgical strike against thoughtless testing of statistical significance” and “an opportunity to register your voice in favour of better scientific practices”. We are not calling for a ban on P values. Nor are we saying they cannot be used as a decision criterion in certain specialized applications (such as determining whether a manufacturing process meets some quality-control standard). And we are also not advocating for an anything-goes situation, in which weak evidence suddenly becomes credible. Rather, and in line with many others over the decades, we are calling for a stop to the use of P values in the conventional, dichotomous way — to decide whether a result refutes or supports a scientific hypothesis5. Again, we are not advocating a ban on P values, confidence intervals or other statistical measures — only that we should not treat them categorically. This includes dichotomization as statistically significant or not, as well as categorization based on other statistical measures such as Bayes factors. One reason to avoid such ‘dichotomania’ is that all statistics, including P values and confidence intervals, naturally vary from study to study, and often do so to a surprising degree. In fact, random variation alone can easily lead to large disparities in P values, far beyond falling just to either side of the 0.05 threshold. For example, even if researchers could conduct two perfect replication studies of some genuine effect, each with 80% power (chance) of achieving P < 0.05, it would not be very surprising for one to obtain P < 0.01 and the other P > 0.30. Whether a P value is small or large, caution is warranted. We must learn to embrace uncertainty. One practical way to do so is to rename confidence intervals as ‘compatibility intervals’ and interpret them in a way that avoids overconfidence. Specifically, we recommend that authors describe the practical implications of all values inside the interval, especially the observed effect (or point estimate) and the limits. In doing so, they should remember that all the values between the interval’s limits are reasonably compatible with the data, given the statistical assumptions used to compute the interval7,10. Therefore, singling out one particular value (such as the null value) in the interval as ‘shown’ makes no sense. We’re frankly sick of seeing such nonsensical ‘proofs of the null’ and claims of non-association in presentations, research articles, reviews and instructional materials. An interval that contains the null value will often also contain non-null values of high practical importance. That said, if you deem all of the values inside the interval to be practically unimportant, you might then be able to say something like ‘our results are most compatible with no important effect’. When talking about compatibility intervals, bear in mind four things. First, just because the interval gives the values most compatible with the data, given the assumptions, it doesn’t mean values outside it are incompatible; they are just less compatible. In fact, values just outside the interval do not differ substantively from those just inside the interval. It is thus wrong to claim that an interval shows all possible values. Second, not all values inside are equally compatible with the data, given the assumptions. The point estimate is the most compatible, and values near it are more compatible than those near the limits. This is why we urge authors to discuss the point estimate, even when they have a large P value or a wide interval, as well as discussing the limits of that interval. For example, the authors above could have written: ‘Like a previous study, our results suggest a 20% increase in risk of new-onset atrial fibrillation in patients given the anti-inflammatory drugs. Nonetheless, a risk difference ranging from a 3% decrease, a small negative association, to a 48% increase, a substantial positive association, is also reasonably compatible with our data, given our assumptions.’ Interpreting the point estimate, while acknowledging its uncertainty, will keep you from making false declarations of ‘no difference’, and from making overconfident claims. Third, like the 0.05 threshold from which it came, the default 95% used to compute intervals is itself an arbitrary convention. It is based on the false idea that there is a 95% chance that the computed interval itself contains the true value, coupled with the vague feeling that this is a basis for a confident decision. A different level can be justified, depending on the application. And, as in the anti-inflammatory-drugs example, interval estimates can perpetuate the problems of statistical significance when the dichotomization they impose is treated as a scientific standard. Last, and most important of all, be humble: compatibility assessments hinge on the correctness of the statistical assumptions used to compute the interval. In practice, these assumptions are at best subject to considerable uncertainty7,8,10. Make these assumptions as clear as possible and test the ones you can, for example by plotting your data and by fitting alternative models, and then reporting all results. Whatever the statistics show, it is fine to suggest reasons for your results, but discuss a range of potential explanations, not just favoured ones. Inferences should be scientific, and that goes far beyond the merely statistical. Factors such as background evidence, study design, data quality and understanding of underlying mechanisms are often more important than statistical measures such as P values or intervals. The objection we hear most against retiring statistical significance is that it is needed to make yes-or-no decisions. But for the choices often required in regulatory, policy and business environments, decisions based on the costs, benefits and likelihoods of all potential consequences always beat those made based solely on statistical significance. Moreover, for decisions about whether to pursue a research idea further, there is no simple connection between a P value and the probable results of subsequent studies. Our call to retire statistical significance and to use confidence intervals as compatibility intervals is not a panacea. Although it will eliminate many bad practices, it could well introduce new ones. Thus, monitoring the literature for statistical abuses should be an ongoing priority for the scientific community. 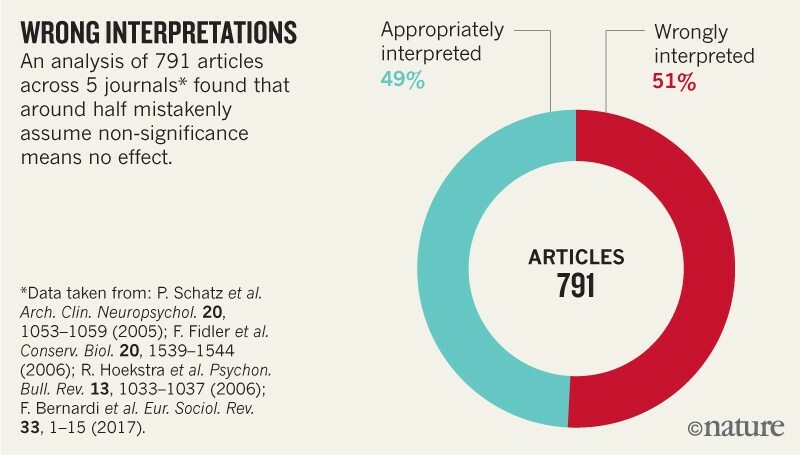 But eradicating categorization will help to halt overconfident claims, unwarranted declarations of ‘no difference’ and absurd statements about ‘replication failure’ when the results from the original and replication studies are highly compatible. 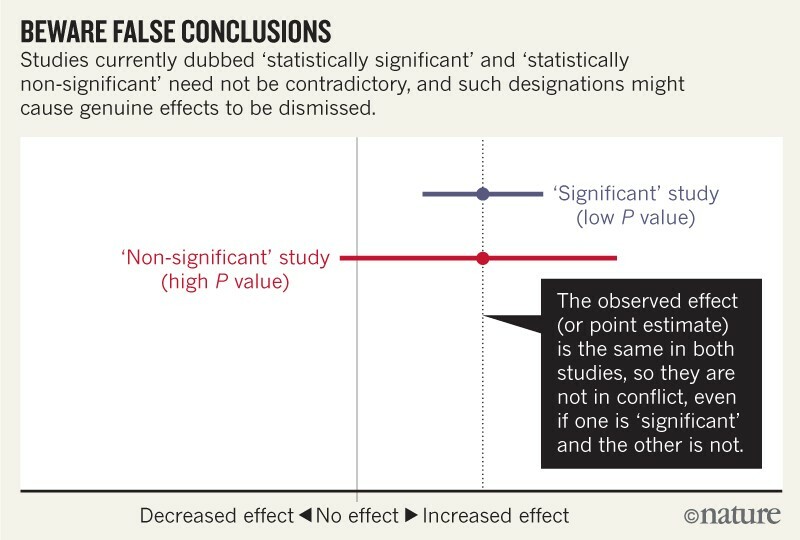 The misuse of statistical significance has done much harm to the scientific community and those who rely on scientific advice. P values, intervals and other statistical measures all have their place, but it’s time for statistical significance to go.